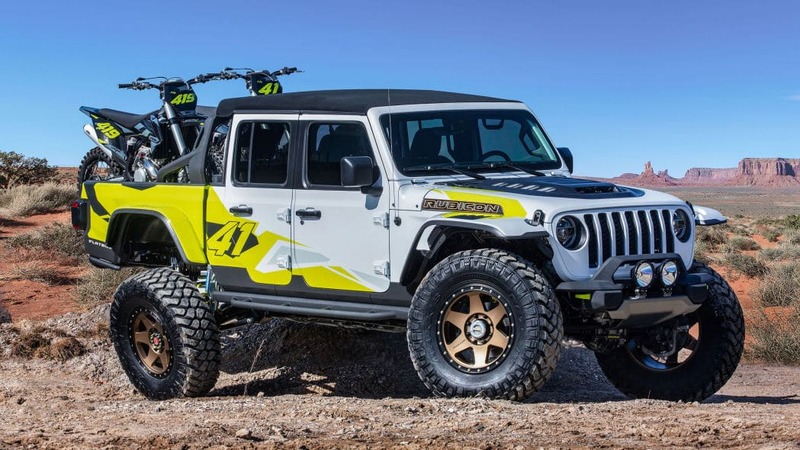 In what is now a yearly tradition, Jeep and Mopar have teamed up to create six new concepts for the Moab Easter Jeep Safari. This year, the new Jeep pickup is the star. 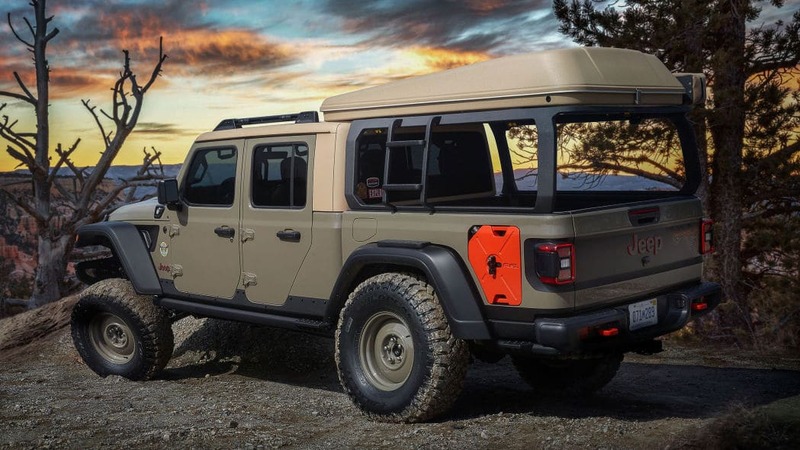 Jeep and Mopar unveiled six new custom concepts inspired by the new Jeep Gladiator for the Moab Easter Jeep Safari which gets underway this week. 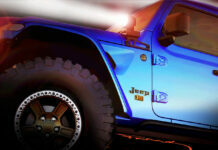 The 53rd Moab Easter Jeep Safari will take place in Moab, Utah, from April 13 to 21. 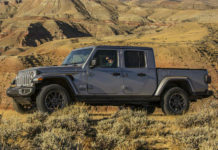 On display will be six impressive pickup concepts based on the 2020 Jeep Gladiator which have all been heavily modified to accentuate the Jeep pickup’s styling and off-road capabilities. 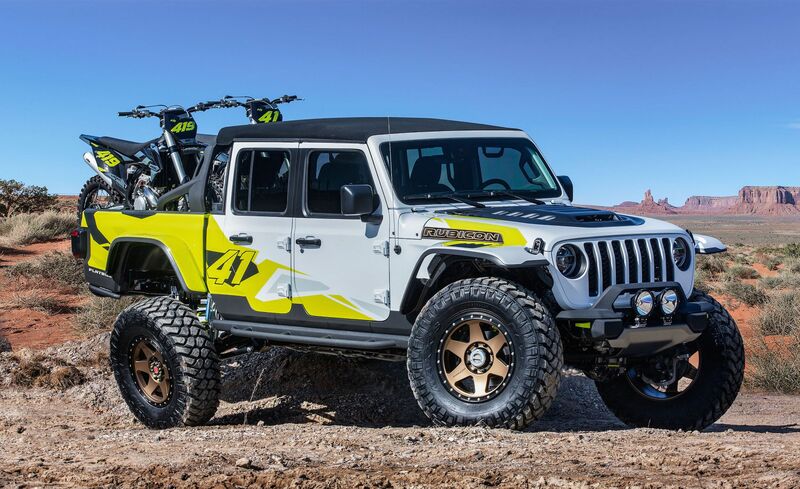 Let’s take a look at what Jeep and Mopar have built for this year’s MEJS. The Jeep Wayout is designed for adventures. 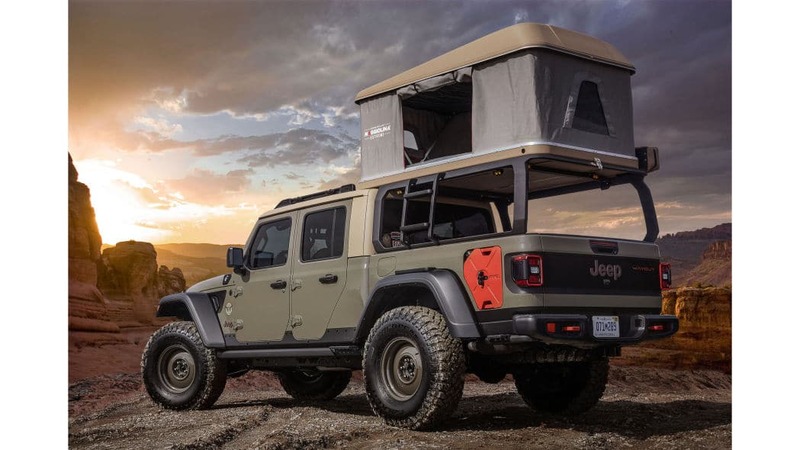 The concept highlights the Jeep Gladiator’s class-leading payload capabilities by installing a full roof-top tent and a canopy. The tent can sleep two and there’s an integrated ladder to access it. 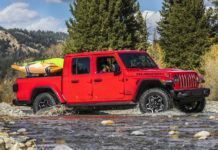 The pickup is painted in Gator Green which is available on the new 2020 Jeep Gladiator. There are two new fuel tanks integrated into the bedsides as well as an on-board air system and quick disconnect air supply line in case you want to go even further up the mountain. 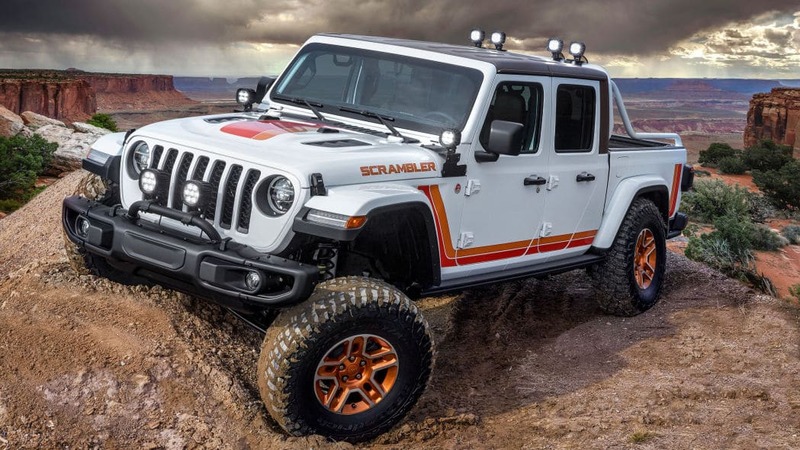 A two-inch lift kit will get you over just about any obstacle, but if that wasn’t enough Jeep also added 17-inch steel wheels with 37-inch mud-terrain tires. A 12,000-pound Warn winch is also included. 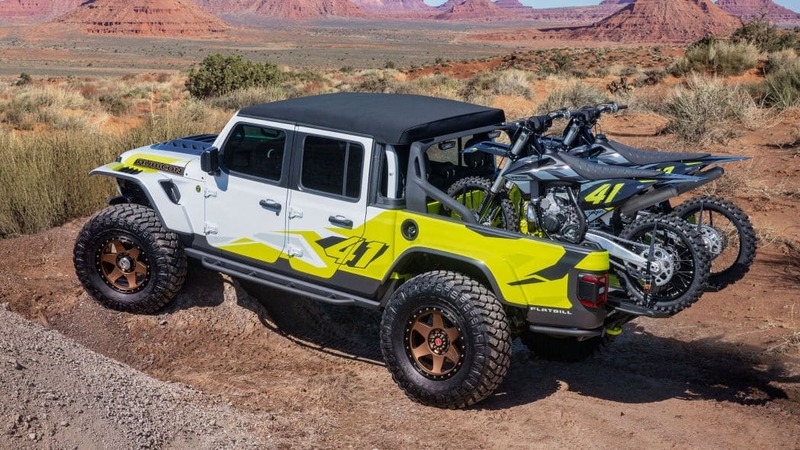 The Jeep Flatbill is a Jeep Gladiator build for dirt bike riders. It is built to transport dirt bikes efficiently by removing the tailgate and installing dedicated wheel ramps. The bed can also lower and a tube rear bumper improves the departure angle. 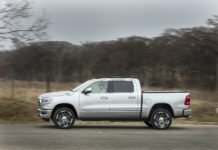 There are massive 20-inch wheels wrapped in 40-inch tires make it possible to go anywhere, and upgraded Dynatrac front and rear axles and four-inch lift kit give even more off-road capability to the Flatbill. The front bumper and skid plate have been shortened as well. The Jeep M-715 Five-Quarter is a modern take on a classic Jeep moniker. 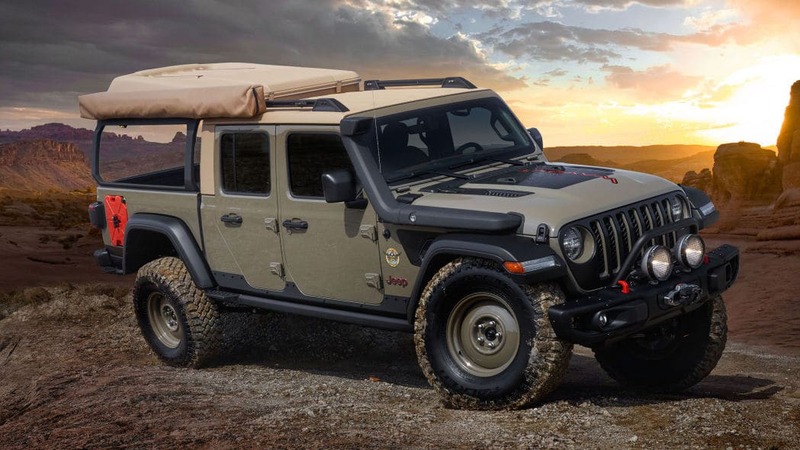 Essentially a military Gladiator, the M-175 Five-Quarter gets a new carbon fiber front end, a 3.5-inch convertible roof drop, and new functional rock rails on the side. 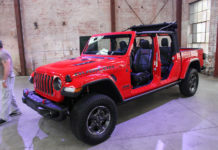 Inside, the modified Gladiator gets Jeep Wrangler seats with no headrests, a new instrument panel which uses aluminium components, and a repurposed 8-71 supercharger now encases the transmission and transfer case shifters. Power comes in the form of a 6.2-liter, supercharged Hellcrate HEMI V8 engine with over 700 horsepower. The Jeep J6 takes the classic Jeep design of the past with a range of Mopar performance parts for more power. 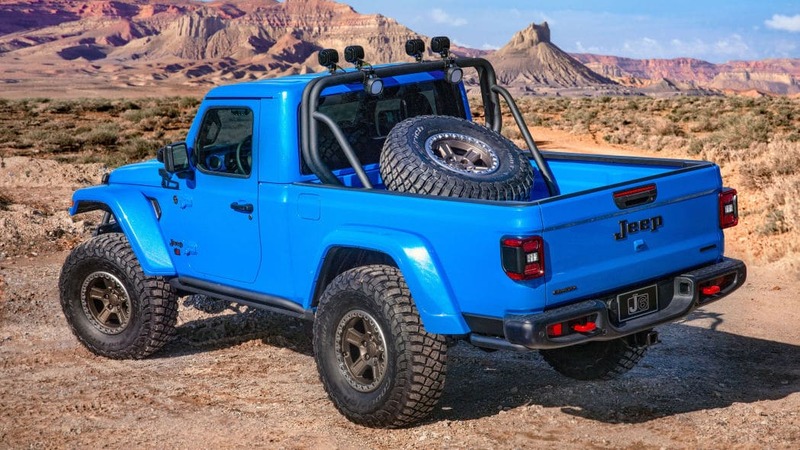 Starting with a Jeep Gladiator Rubicon, Jeep and Mopar made the bed 12 inches longer than the regular Gladiator and painted the exterior Metallic Brillant Blue as a nod to the 1978 Jeep Honcho. New 17-inch wheels have a retro deep dish design and are wrapped in 37-inch tires. A spray-in bedliner, Jeep Performance Parts LED lights that shine at 4,800 lumens each, a cold air intake for the 3.6-Pentastar V6, Katzkin leather seats, and a bright pedal kit are just a few of the other modifications made to the Jeep J6. The Jeep JT Scrambler takes the best of the legendary CJ Scrambler and adds available Jeep Performance Parts for a unique look and take on a classic. 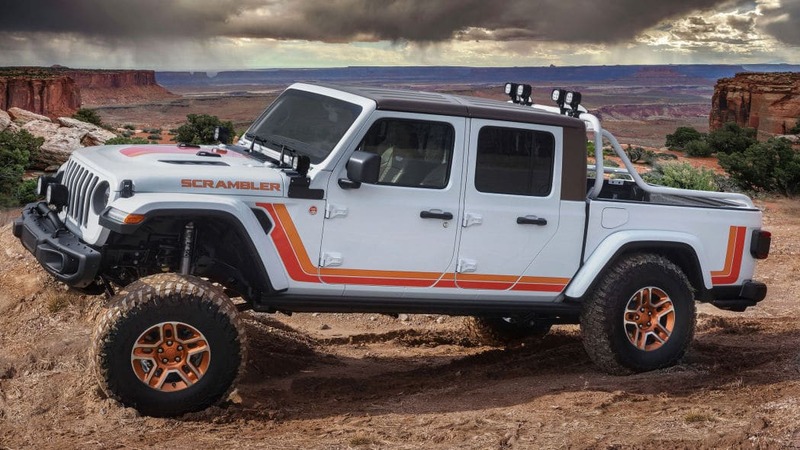 The JT Scrambler packs a ton of Jeep Performance Parts including four five-inch LED lights on the roll bar and LED task lights to illuminate the bed. 17-inch slot wheels are wrapped in 37-inch tires and the 3.6-liter V6 gets a cold air intake and a cat-back exhaust. 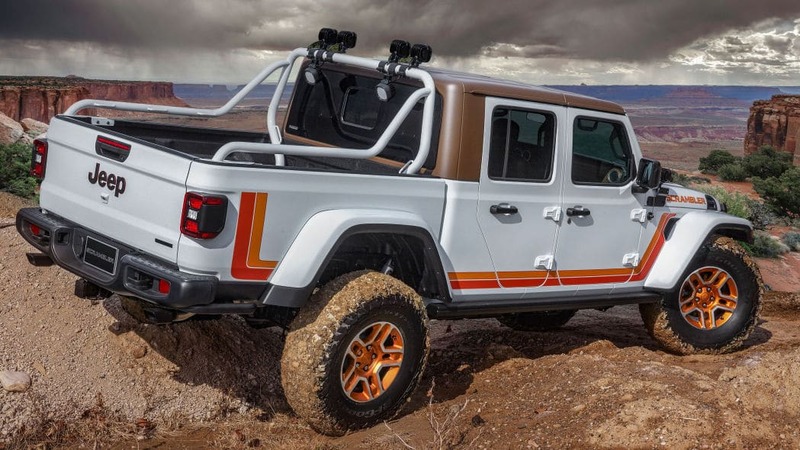 The Jeep Gladiator Gravity is meant to climb rocks. Any kind of rocks. The truck features parts that new Gladiator owners will be able to buy right out of the gate. A Mopar truck bed storage, cross rails and cargo carrier give rock climbers the ability to store all of their gear. 17-inch wheels, 35-inch tires, cold air intake and a cat-back exhaust are also part of the deal. 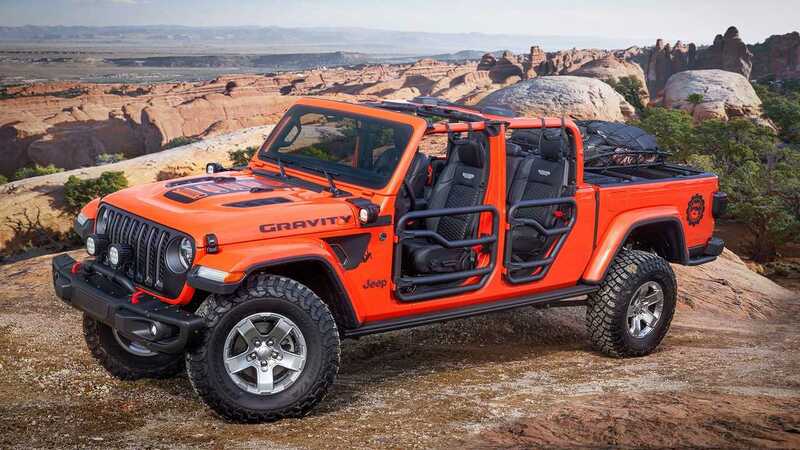 The Jeep Gladiator Gravity puts the new Gladiator’s open-air abilities on display with two-inc round steel tube doors from Mopar along with a mesh sunbonnet to provide cover while letting light seep in.